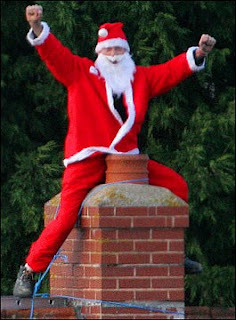 A seasoned Fathers 4 Justice campaigner has pledged to stay on the roof of a judge's house near Exeter for weeks after setting up camp dressed as Santa Claus.But last night Jolly Stanesby, a veteran of high profile protests, was bracing himself for an attempt by police to remove him. He had roped himself to a chimney on Judge David Tyzack's Glebe Lodge home in Farringdon at 6.30am yesterday. Last night he had set up a tent on the roof, was eating food he had taken with him and was listening to a radio. It was not known whether Judge Tyzack had returned. As first revealed on the Echo's website www.thisis exeter.co.uk, the campaigner climbed on to the roof in protest at court rulings about contact he can have with his child. Mr Stanesby claims he has a sleeping bag, wet weather gear and enough food to allow him to stay for several days. Beyond that he wants supporters to keep supplies topped up so he can maintain his protest for weeks, but it is not yet clear whether police will allow that to happen. Officers, who have cordoned off the area, spent yesterday trying to persuade Mr Stanesby to come down. 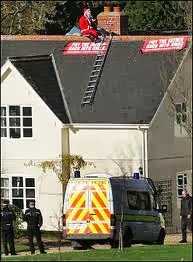 He used a ladder to reach Judge Tyzack's roof where he unfurled a banner that read 'Put the Father back into Xmas'. Judge Tyzack QC has incensed Fathers 4 Justice supporters with rulings about access to children. Mr Stanesby, 37, a registered child minder from Ivybridge, is unhappy at the amount of contact time courts have granted him. Speaking to the Echo from the roof, Mr Stanesby said: "I want to have a share in my daughter's life and there's no reason why I shouldn't.Judge Tyzack has got a bad reputation for not giving fathers good contact time with their children. He and other judges cannot carry on like this. Judge Tyzack came out and I told him why I was here." The judge, who sits at Exeter and Plymouth County Courts on family cases, phoned police after discovering Mr Stanesby on his roof. Thinking the noise on his roof was a rogue or injured bird, he had initially emerged with a shotgun. Police closed roads around Farringdon to prevent other protesters joining him. Fathers 4 Justice supporters near the scene said more high-profile stunts were planned to seek changes to the 1989 Children Act and enable fathers to have joint custody of their children. Meanwhile, around a dozen Fathers 4 Justice protesters were dispersed by police outside Exeter Crown Court. They warned of further protests at the homes of the former President of the Family Division, Dame Elizabeth Butler Sloss, at Marsh Green,near Exeter, and Mrs Justice Bracewell at Somerton, Somerset. This after five years of wasted, unnessesary,and constant court battles. Judge Tyzack likes me so much he refuses to leave my case. He was more interested in the clothes I was wearing, than the welfare of my little girl. It would be more suitable if he was cleaning the cafcass toilets, than deciding what is best for children. Margaret Hodge was in the dock today facing trial for the false imprisonment of Margaret Hodge former Child Minister.No you didn't read that wrong. Prior to the hearing Jolly had had his name changed by deed poll to Margaret Hodge.The judge presiding was not too happy at the site of the campaigner from South West England, who was wearing a T-Shirt stating "FCUK The Family Courts". He was even less amused when he asked the protesting father his name and he replied "Margaret Hodge".Mr Hodge pleaded not guilty to CPS false imprisonment charge, which is two years in the making and the trial has been adjourned until 5th February 2007. On the 15th November fellow activist and campaigner Jason Hatch, made famous for his Buckingham Palace Batman stunt, faces the same charges in connection with the same incident.